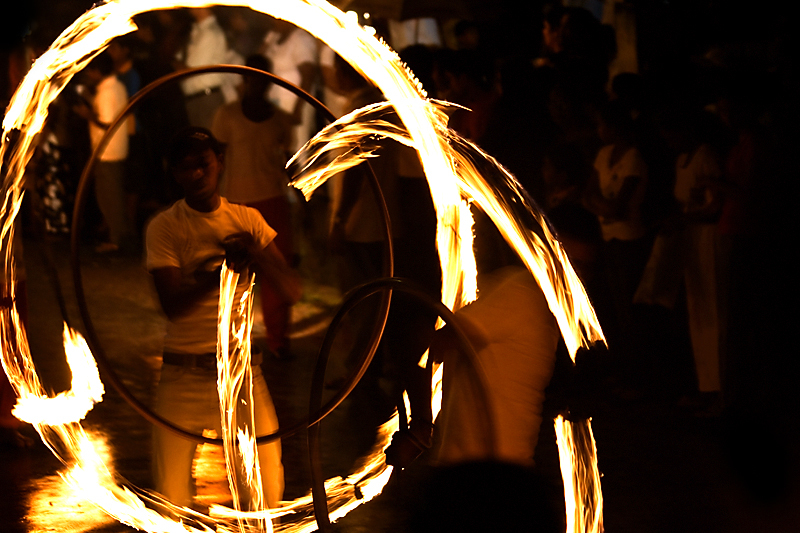 Fire spinners seen at the “Esala Perahara” (pageant) of our neighboring temple. did u use a tripod? Woooooooooooooooowwww! I super envy your cam!! lol This is truly amazingly spellbinding capture! Thanks for the comment. Glad you like it! Nop this was shot while handheld. Used AV+ 2 (In Canon don’t know what you call it in the nikon cams) stops since the light was very low at the scene. I have more of the fire spinner’s pics but not the perahara pics. Let me try to share few more with you. Lovely! how did you manage to get this? Really awesome! I love the action of the picture. We should seriously consider meeting up. Well! I used aperture priority mode in my cam with higher ISO setting (400 in this case). If I would have gone more higher than this( like ISO 1600) it could have add too much noise to the pic and destroy the details of it. Since I have sets a lower aperture (f 4.5) camera has automatically set the very low shutter speed (1/13s)to enable more light to come in just to compile balanced pic. This is where the camera records the motion of the subject due to low shutter speed. Yeah bro! Why don’t you drop me a mail in my email addy given here? I would love to catch up with you guys. This is a marvellous photo capture! all the excitment of the 'perahera' is there! Thanks for your lovely comment K.